The 16th BORP Hoops Classic was its usual full schedule of hooping heaven enhanced by the start to finish play-by-play of Steve Harwood and Bill Brobeck. BORP All Stars went 4-2 and played with energy and commitment throughout the weekend. Standout offensive performances were turned in by Kenny Johnson, Sam Craven, Steve Lau and Troy Plunkett with the whole team contributing to the stingy defense. Coach Lai is to be commended for effectively juggling our huge roster, maintaining his positive leadership and relentlessly picking/screening to get our shooters good looks! THANKS: In addition to the wonderful work of the announcers, we were supported by a stellar cast of volunteers and the generous hospitality of the Coast Guard. The excellent refereeing of Mario, Myles and Li keeps the games and schedule moving and their commitment to this event is greatly appreciated. 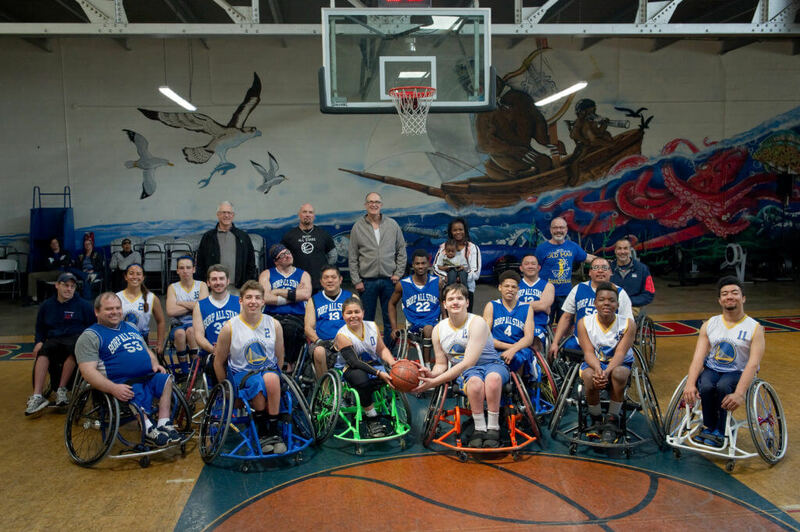 Thanks to Scot Goodman for the photo above of the BORP All Stars, the BORP Junior Road Warriors and announcers Steve and Bill.